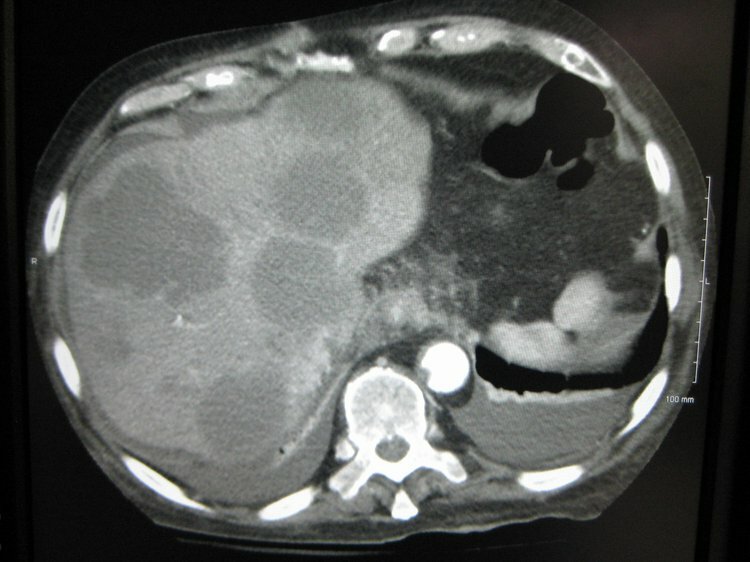 CT scan demonstrating Large load of Metastatic disease to the Liver. (Metastitic liver disease and HCC are the most common indications for chemoembo). Depending upon the location of the tumor, different blood vessels are used to inject the agents. Why is the Chemoembolization radiology procedure Performed? There have been no recent advances to replace the Chemoembolization procedure. What is the Cost of performing the Chemoembolization radiology procedure? The cost of a Chemoembolization procedure depends on a variety of factors, such as the type of your health insurance, annual deductibles, co-pay requirements, out-of-network and in-network of your healthcare providers and healthcare facilities. How does the Chemoembolization radiology procedure work? Chemoembolization is used mainly for liver cancers, because the liver has a dual blood supply from the hepatic artery and the portal vein. How is the Chemoembolization radiology procedure Performed? A Chemoembolization procedure is performed as an outpatient procedure at a hospital. An interventional radiologist performs the Chemoembolization procedure. The Chemoembolization procedure usually takes about 90 minutes. An interventional radiologist interprets the result of the Chemoembolization procedure. A physician will request your consent for a Chemoembolization procedure using an Informed Consent Form. What are the Limitations of the Chemoembolization radiology procedure? What is a Chemoembolization procedure? What is to be expected during the Chemoembolization radiology procedure? The patient is administered general anesthesia for the Chemoembolization procedure. The Chemoembolization procedure is a minimally invasive procedure. It involves little or no blood loss. What are the possible Risks and Complications during the Chemoembolization radiology procedure? What Post-Operative Care is needed at the Healthcare Facility after the Chemoembolization radiology procedure? The patient is required to stay in the hospital for an overnight observation. Sometimes, they may be required to stay in the hospital for a few more days, as determined by the healthcare provider. What is to be expected after the Chemoembolization radiology procedure? What Post-Operative Care is needed at Home after the Chemoembolization radiology procedure? The patient is required to take bed rest for 6-8 hours after the procedure. No tissue sample is taken during a Chemoembolization procedure. Who will you receive a Bill from, after the Chemoembolization radiology procedure? The patient is advised to inquire and confirm the type of billing, before the Chemoembolization procedure is performed.